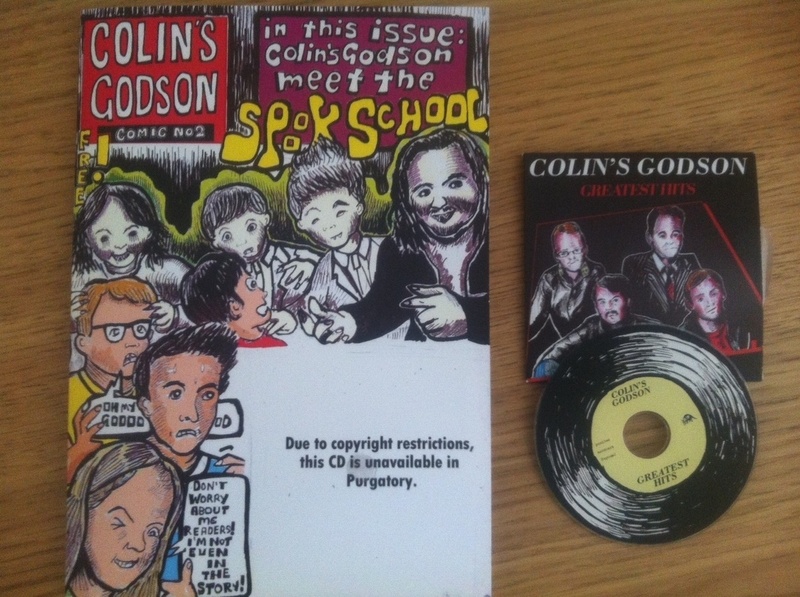 Holding Colin’s Godson Comic #2 in my hands I see that you went back in time to the London of 1996. In a fabulous coincidence, I myself spent 10 days in that fair city in May of that year where I met the brother of a secret vampire. It can’t be coincidence that I am now holding your greatest hits collection, conveniently and thoughtfully tacked to the outside cover. The comic art seems to be an integral component of the CG experience, what was the inspiration for it and is it done in house? How did you end up deciding which 12 songs would end up on the greatest hits collection? ‘Stadium Rock’ leads things off. One advantage of living on this side of the Atlantic Ocean musical popularity inversion prism is that we occasionally get to see the likes of Biffy Clyro or the Manic Street Preachers in rather small venues. What is CG’s take on the power of music and the dangers of the excessively popular? “Colin’s Godson in Space” was your choice for the second song. Other than this one, of course, what is your favorite song about space? It should be apparent by now that I’m following the track sequence so I’ll stop mentioning each song title, but why exactly did Blackadder let you down so much and apparently so often? It was only after the second listen and an internet check that I realized that a missing tuner pedal is the center of the song ‘Nothing Compares’; although it could still be considered a boy loses girl love song. You seem to go out of your way to concoct clever and different lyrics. Is there any method to your madness? As a songwriter how in the world do you avoid tripping over the same old cliché? “Theres no moon, it’s the Death star” is a perfect illustration of the previous point. In the face of the music industry evil empire, do you think independent labels have a better chance these days of eking out their own existence and are indie bands better able to take complete control themselves to try and make a go of it given the modern tools at their disposal? Top three bands assaulting the world with their “pretentious kack”? Most of your songs are quite short. Other than the benefits of fitting things on mini CD, is there a design principle behind this choice? “Gary Bushell” is the third name, in as many songs, that I’ve had to look up to help get the references. Clearly, you are not exactly aiming for a global audience. What is the guiding principle behind the band? Should global success suddenly overtake you would you be able to handle the new demands? Paul McCartney was visited in comic #1. Who would you consider spending ‘time’ with for comic #3? I did not know that Brian May was an astrophysicist. Perhaps more directly relevant to the musician than tax dodging, what are your thoughts on such ‘services’ as Spotify? “How Cheap is your love” might have been inspired by a time trip to 2000 where you heard Frigid Vinegar’s take. I’ve always had the notion that if I could travel in time that I’d take a song catalogue and go way forward when back catalogues where effectively forgotten and become an international superstar. ABBA in 2267! Whose songs would you pilfer? “Back to Earth” closes off with another, by now signature, CG ballad. It effectively demonstrates that despite the tendency to novelty you are adept at creating wonderful pop gems. Has there been any pressure to venture down more conventional roads? I’m drinking my morning coffee from my Dr. Who vanishing Tardis mug and potential Colin’s Godson song suggestions are virtually inevitable: “Where and when did I park the Tardis and why can’t it make a decent cup of tea?” Potential? I want to reference your ‘Never Mind Sigur Ros’ CD since I just finished listening to their album stream. I’ll inevitably buy it, but if I was stuck in a detention oubliette, I’d much rather listen to CG than more of this, by now, predictable bleating. For yourselves, is there a change in musical direction in your future? Will you crack the 3 minute song barrier? Whatever did happen to Northern Uproar? I heartily recommend checking out CG. Here’s the link for the songs mentioned above. Should you have been induced to read it makes for excellent, if not essential, musical accompaniment. Needless to say, check out all the rejected songs as well. This entry was posted in Bands We've Chatted With.